Beit HaNassi (Hebrew: בֵּית הַנָּשִׂיא ("President's House"), also known as Mishkan HaNassi (Hebrew: מִשְׁכָּן הַנָּשִׂיא) is the official residence of the President of Israel. It is located in the Talbiya neighborhood of Jerusalem. Israel's first president, Chaim Weizmann, lived in his private villa in Rehovot. 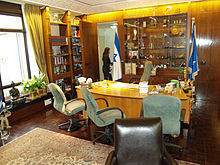 His successor, Yitzhak Ben-Zvi, lived in a modest apartment in Rehavia and used a wooden cabin, known as the "tzrif", or "cabin", as his official reception hall. After President Ben-Zvi's death in 1963, the government decided to build a permanent residence for the head of state. The original idea was to incorporate it in a complex of government ministries, but the state's third president, Zalman Shazar, who was very much a man of the people, wanted to live in a residential area and not in splendid isolation, and persuaded the government. As a result, they approved the construction of a permanent presidential residence on a 10-dunam plot in Talbiya. A competition for the architectural design was launched in 1964 and limited to Israeli architects. Of some 200 entries, the design submitted by Jerusalemite architect Abba Elhanani was selected. Beit HaNassi was inaugurated in 1971 by President Shazar. The designs came under harsh criticism from different public figures. During the visit to Israel of Pope Benedict XVI in 2009, President Shimon Peres inaugurated a new custom that all visiting world leaders would plant an olive tree in the Beit HaNassi peace garden. In October 2017, work was completed on a new, enlarged entrance to Beit Hanassi to enable faster processing of visitors to major events at the residence. ^ a b c Greer Fay Cashman (30 April 2009). "Rothschild family steps in to rescue Beit Hanassi". Jerusalem Post. Retrieved 26 July 2018. ^ a b c d David Kroyanker (3 March 2010). "From modesty to monstrosity". Haaretz. Retrieved 26 July 2018. Wikimedia Commons has media related to Beit HaNassi. This page was last edited on 26 September 2018, at 04:57 (UTC).